When I was in 7th grade (way back when…) I was so excited to take home economics. I could hardly wait to learn all sorts of new cooking techniques. I loved to cook even back then. 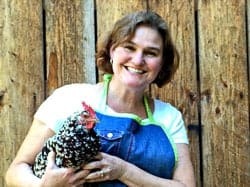 I loved reading cookbooks and planning dinners. I hope my skills have improved since then, but I thought I was quite the chef! My poor family had to suffer through all my creations and mistakes that I’m certain I made. Every time I make cinnamon swirl bread, I am transported back to my middle school cooking class. I didn’t learn how to make cinnamon swirl bread in that class. Nope. Nothing even close. Much to my disappointment we learned how to measure liquids properly and how to sift and measure flour. We also learned how to make cinnamon toast in the oven! I remember thinking, Really! We are buttering bread and sprinkling it with cinnamon and sugar and popping it in the oven. Who doesn’t know how to do that? I was quite perplexed, but I suffered through those basic techniques. Now anytime I make any kind of bread with cinnamon, I always think about that funny class. I’m certain I had to finish out the semester and probably even the year, but did I sign up for Home Economics II? NOPE….I went straight into wood and metal shop! There I learned how to use all sorts of fancy tools and made a shadow box, a plant stand, and a dust pan. Truly useful items! That class was amazing until my hair got caught in the fan on the belt sander. But that’s a story for another day! Making this dough is easy. It’s a lot like making cinnamon rolls, but instead of cutting the dough, you plop it into a bread pan. Easy Peasy! Pour milk, yeast and sugar in a bowl of a stand mixer. Let stand for 5 minutes until yeast is bubbly. 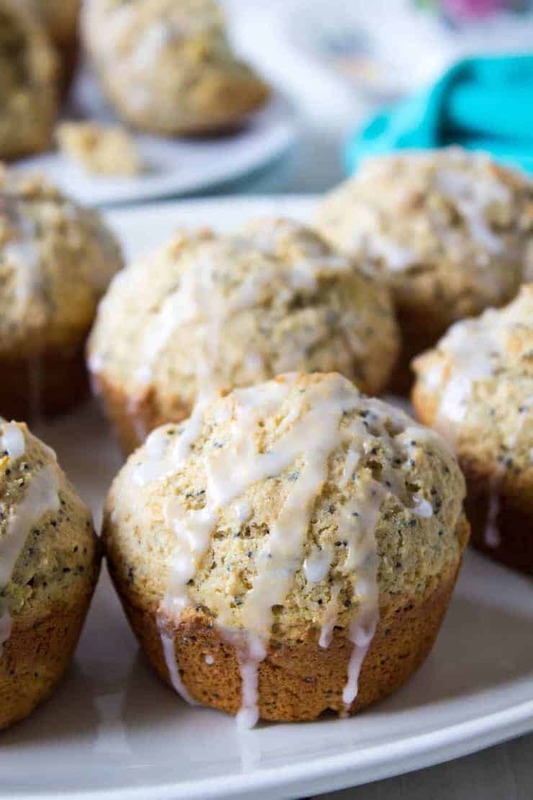 Continue adding flour one cup at a time until a soft dough is formed. You might not need all the flour. Knead with mixer for 5 minutes. Place in greased bowl and cover with plastic wrap sprayed lightly with non stick spray or a clean, dry dish towel. Roll out one half at a time. Roll each into a rectangular shape about 8 inches X 12 inches long. 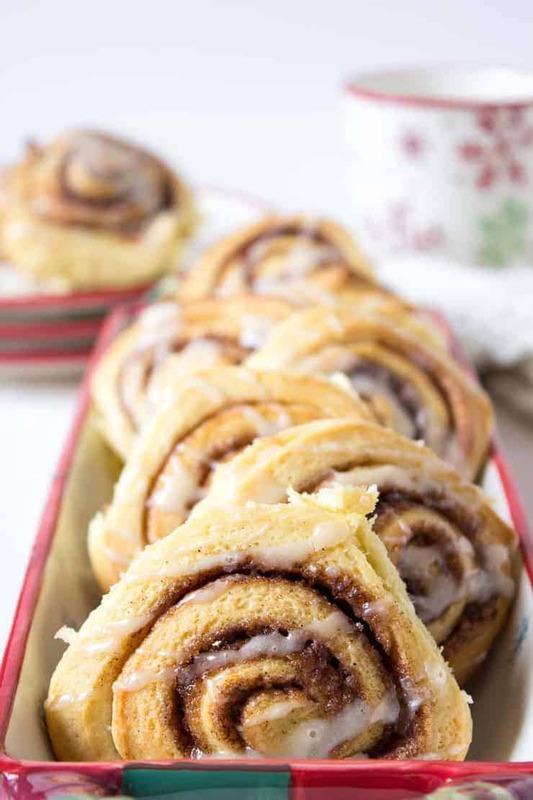 Cover rolled dough with melted butter and half cinnamon sugar mixture. 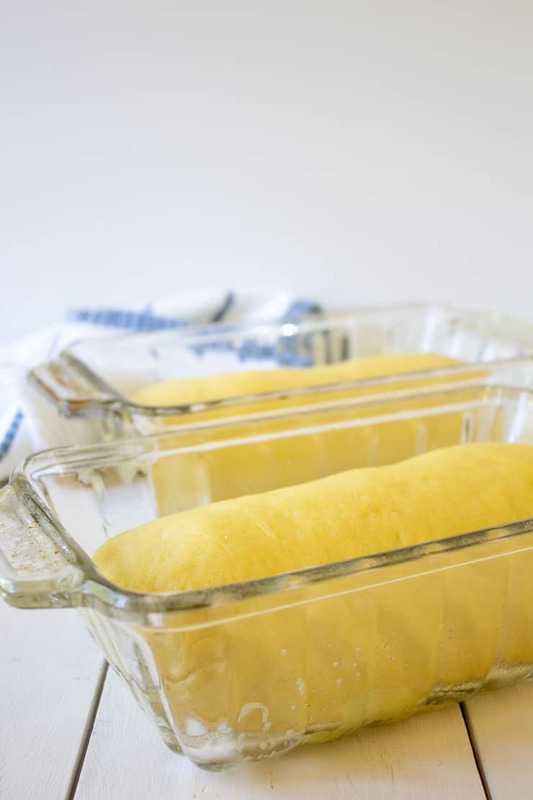 Roll dough into a log, pinch seams together. Bake in a preheated 375 F. oven for 35 minutes. Let cool on a rack for 5 minutes. 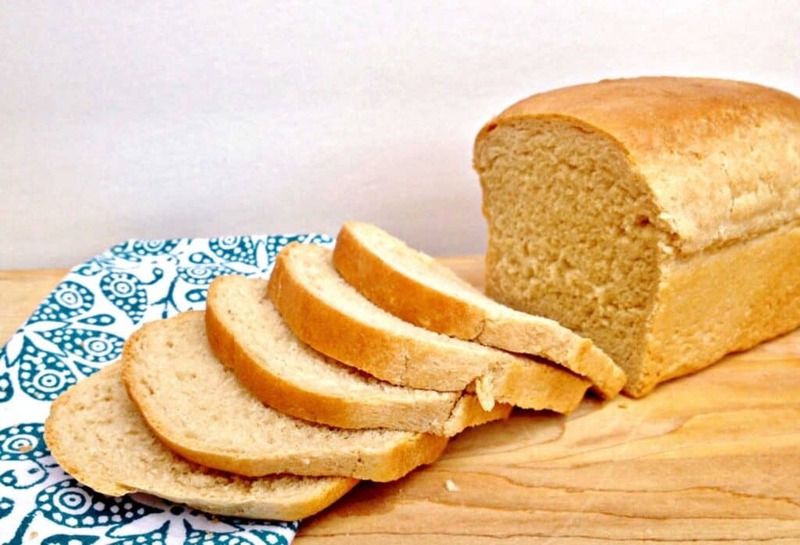 Remove bread from pan. Continue cooling on rack before slicing. 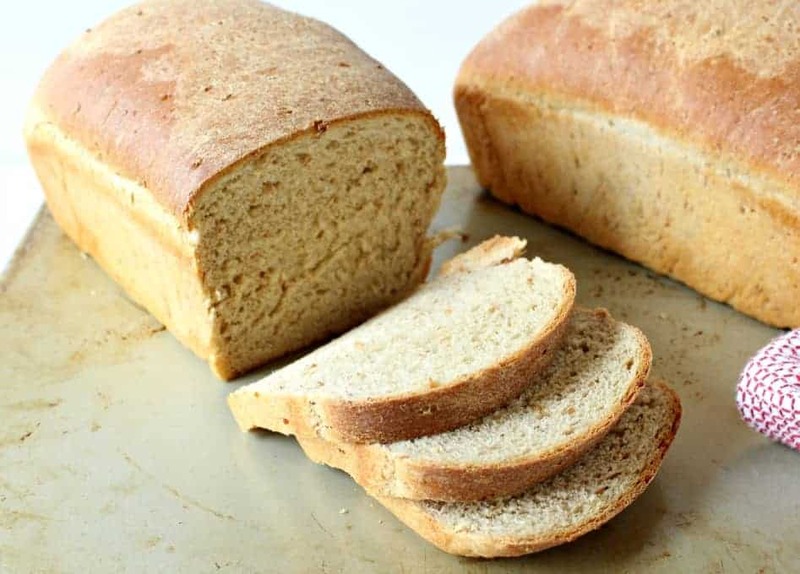 OMG you perfected the crap out of this bread and it looks ABSOLUTELY STUNNING!!! Oh my goodness – I remember the cinnamon toast from Home Ec., too!! You’ve come a long way, baby!! This bread looks and I can imagine smells divine! Gosh…maybe we had the same teacher. Either that or making cinnamon toast was the standard! 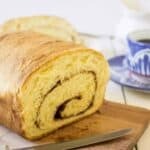 I love making Cinnamon Swirl Bread! Can’t wait to try this version 🙂 It’s gorgeous! When I was in grade school we didn’t have home ec – we had SEWING. Which was nowhere near as fun – I think that’s why I love my kitchen so much today, because I am making up for lost time! When I could have been making delectable cinnamon swirl bread!! I never took sewing, although it was offered. My sewing skills are really basic. The smell of baking bread is my favorite. WOW! Kathy, I am seriously impressed. What a masterpiece! It’s almost too pretty to eat! I LOVE this! Oh no, your hair got caught in the belt sander!!! I love that you were so adventurous. I remember learning in Home Ec class to put the top back on the milk jug after pouring from it. I kid you not. Maybe our teachers were related. This bread is absolutely gorgeous and I would love to make cinnamon toast or french toast out of it. Seriously! It is perfection. So funny! The sad thing is some people may have needed to learn how to measure water and put the lid back on the milk jug! 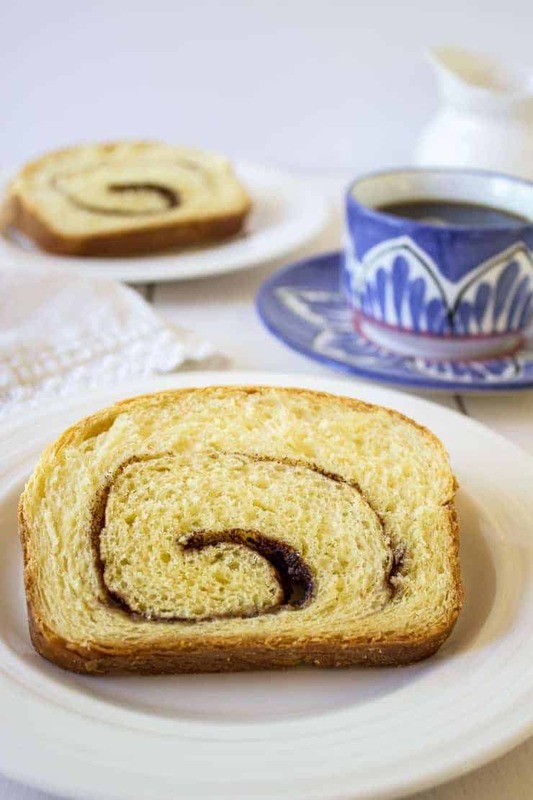 I love cinnamon swirl bread, Kathy – so yummy and the smell is so wonderful. I wonder what they call Home Ec now? We didn’t do any baking but I made a great big stuffed hippo pillow! And yikes – your poor hair! A purple hippo! Lovely!!! My hair survived without any damage. They unplugged the machine and used a screw driver to lift off the fan cover. They just had to then untwist my hair. I just remembering I was super embarrassed! I can only imagine how this would smell wafting through ones house! Swoon. Home ec. Haha. I don’t even think they offer it that much anymore. Have to say, that was not my forte!! 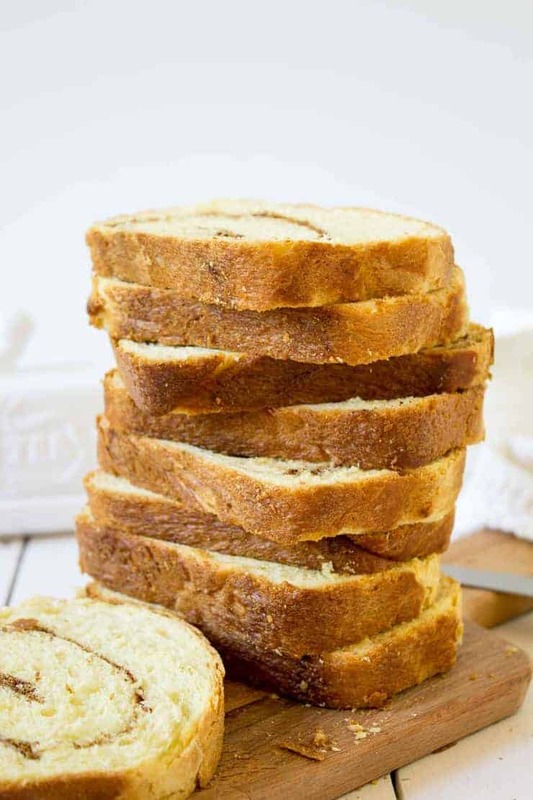 this is one of my favorite breads, looks super delicious Kathy! It is indeed super delicious! 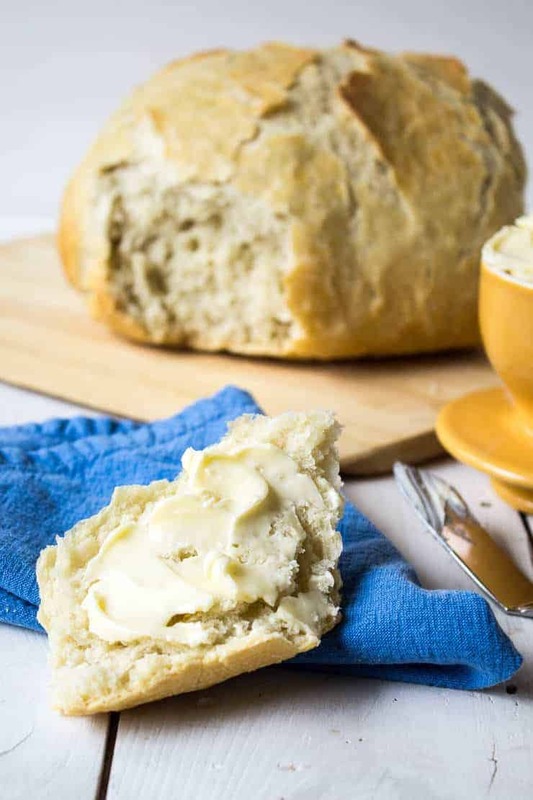 This is a gorgeous bread and I need to try it very soon! Love cinnamon! I love just about anything with cinnamon. 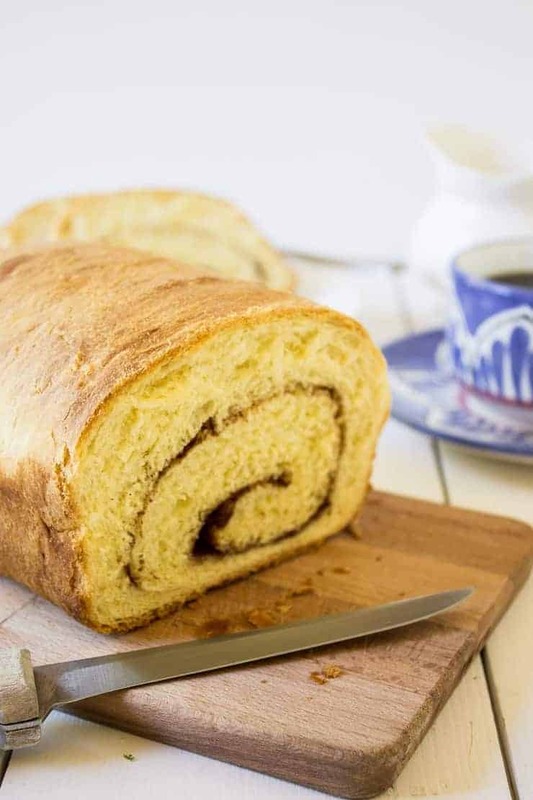 Cinnamon bread is absolutely one of my favorite breads, and I could totally get behind a loaf or two of this showing up in my kitchen. And it might be underwhelming, but I can get behind cinnamon sugar toast, too. That takes me back to my grade school days right there! I still love cinnamon toast…I just want it to be the skill I learned in home ec…..I wanted the advanced stuff! 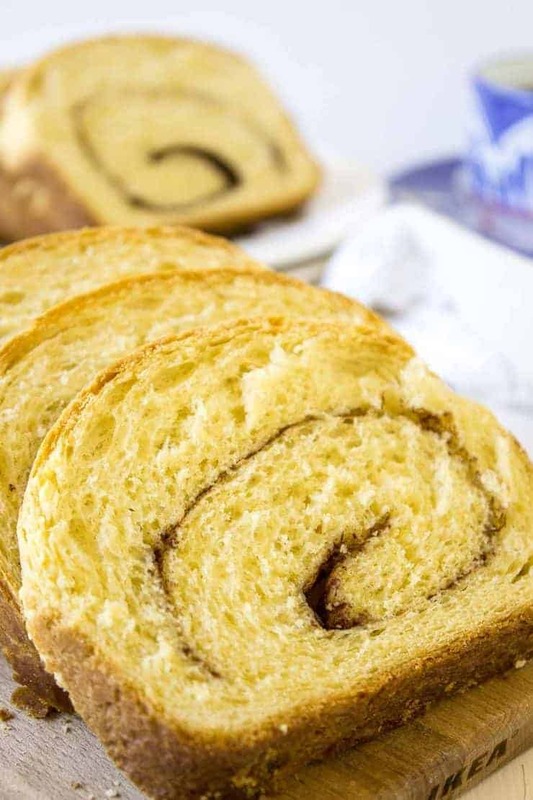 My grandmother’s favorite bread was cinnamon swirl bread. I used to make it for her at least every other week, so seeing this post brings back warm memories for me. Your bread looks perfect, Kathy! Swirly and delicious! I know my grandmother would have given this two thumbs very high up… and then devoured the whole loaf. 😉 Cheers, friend! There’s nothing better than approval from a Grandma! Thanks for the two thumbs up!!! 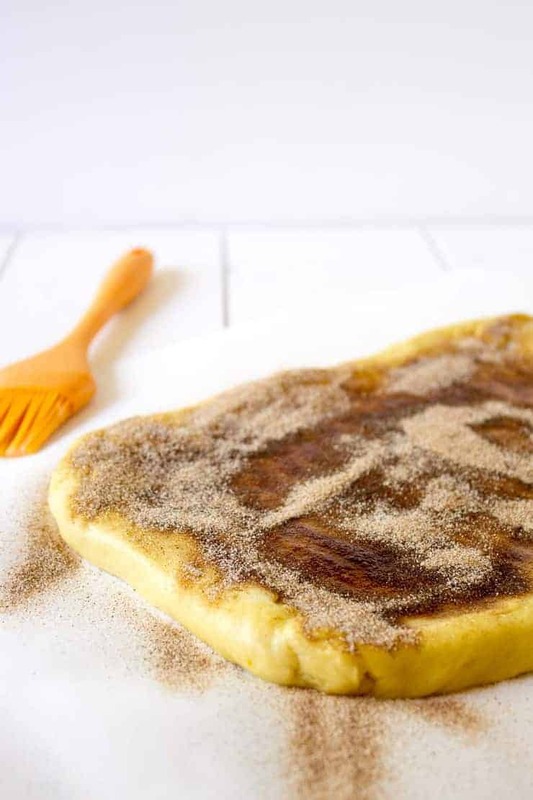 Cinnamon toast is one of my favorite things for breakfast Kathy! Reminds me of my grandmother! She loved it with her tea! This looks easiest enough for me to try! How well I remember- the girls in Junior High had to take Home Economics and the boys had to take ‘Shop’- there were no switching of roles. 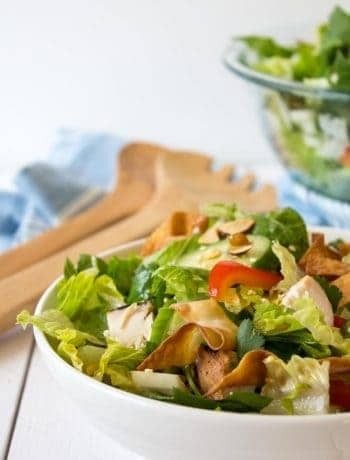 Your recipe looks delish- are there instructions to go with your recipe? (Maybe we can manage with out any instructions)! I can’t wait to check it out! Sounds delicious!